NEW HOLLAND, PA – According to leadership at Superior Walls of America, the housing market recovery is in the basement — literally. The leading manufacturer of precast concrete foundation systems has seen a 20 percent increase in year-to-date sales for 2013 over the same January through May timeframe in 2012. The precast concrete panels manufactured at Superior Walls facilities across the country are the foundation system of choice for both energy-conscious homeowners and construction-savvy builders. According to the 2012 National Association of Home Builders™ (NAHB®) “What Home Buyers Really Want” study, basements are considered especially desirable in homes by younger home buyers and those living in colder climates. The same study showed that energy efficient features of products are extremely important to home buyers in all age ranges and in all geographic locations. This does not surprise Costello, whose company has seen steady growth of sales over the years thanks to the energy efficiency qualities of their precast concrete basement foundation systems. “Superior Walls can help create an ENERGY STAR® qualified home. As a custom wall assembly, Superior Walls contribute to the overall home insulation value and reduce air infiltration into the home, thereby making a huge impact on the overall energy efficient rating of the house. Xi precast concrete panels by Superior Walls are steel-reinforced and created in the manufacturing process with DOW® insulation boards, which provide excellent rigid foam insulation. 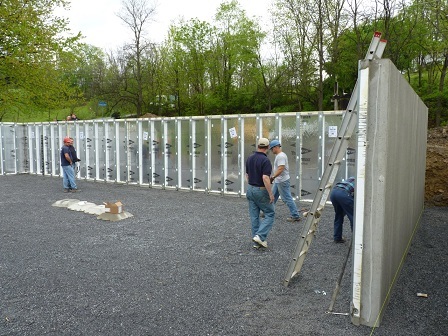 The resulting wall panels provide a dry, warm and exceptionally energy-efficient foundation for a home.